Riley first received the Melissa and Doug Swivel Bridge Set http://www.melissaanddoug.com/swivel-bridge-train-set for "giving up" his paci while we were on vacation in Michigan. Back in August, it was evident that he was intrigued and interested in building, but putting the track together required parental, or babysitter's help. 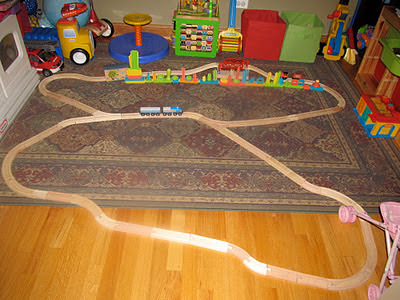 Then, as parents trying to encourage our son's nascent train-thusiasm, we were more fascinated with the set than he was. Loving the chance for adult play therapy, we lost ourselves in the intricacies of possible designs, and problem solved our way out of jams created by an insufficient number/shape of tracks. As a result, I began buying track like a gold hoarder. Jump three months later, to Riley's third birthday, to see his urban planning skills come into full effect. True to the Melissa and Doug philosophy of designing toys that send children's imaginations soaring, Riley likes to design entire cities. I have to admit that it never occurred to me to use other toys with the train set. So much for mom the artist! 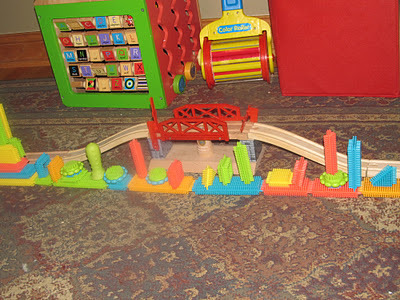 Riley used other building blocks to construct skyscrapers, and built his train tracks into the cityscape, alongside the tall buildings. 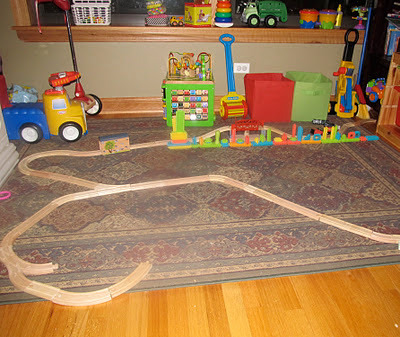 We were begged not to take the train set down at night-time clean up, a request we couldn't refuse. Unable to resist, Dad did some editing overnight. When I can get Riley to play independently, it is amazing to walk into our sunroom to see that he has created a downtown in action. The Swivel Bridge Set is certainly a go-to toy. Even my little girl, who used to prefer to walk along the tracks like a giant in a 50s horror movie, is now starting to show an interest in playing trains. And she would too, if Big Brother were okay with it. Which he most certainly is not. Apparently, I need more track, more trains and an app that hypnotizes your kids into sharing.